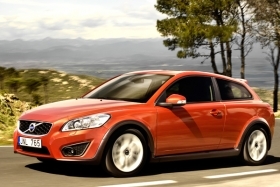 Volvo plans a new entry-level car derived from the C30, shown. Volvo plans to offer a Volkswagen Golf competitor as part of a plan to expand the automaker's product line. Speaking in London last week, new Volvo CEO Stefan Jacoby said the next generation of the entry-level Volvo “will be a derivation of the C30, a Golf competitor,” according to the Web site autocar.co.uk. He also said Volvo's brand positioning would shift toward “functionality and Scandinavian elegance” and away from sportiness, according to the Web site. Jacoby is driving the product assessment at Volvo, which was acquired this summer by Zhejiang Geely Holding Group Co. of China. Volvo had been owned by Ford Motor Co.
Jacoby, the former CEO of Volkswagen Group of America, joined Volvo in August. Last month, Doug Speck, CEO of Volvo Cars of North America, told Automotive News Europe sister publication Automotive News that the automaker is considering a small car that targets BMW's 1 series and a compact crossover to compete with the BMW X1. Based on Jacoby's comments, the automaker is now targeting the Golf instead of the 1 series. Volvo wants a small crossover because "there will be more X1 counterparts in the luxury segment," Speck said at the time. Additionally, the small crossover would help fill the gaps created as Volvo discontinues station wagons in the United States, he said. Said Speck: "The luxury station wagon segment has been on the decline over the last decade, and we have adjusted our product lineup with the XC products."